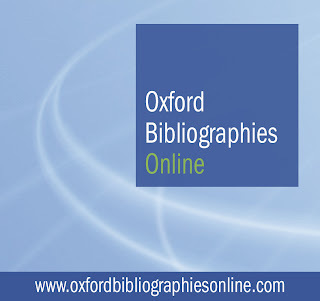 Over at Evangelical Text Criticism, Tommy Wasserman comments on the recently launched Oxford Bibliographies Online. This is intended to be an expert guide to the best available scholarship. 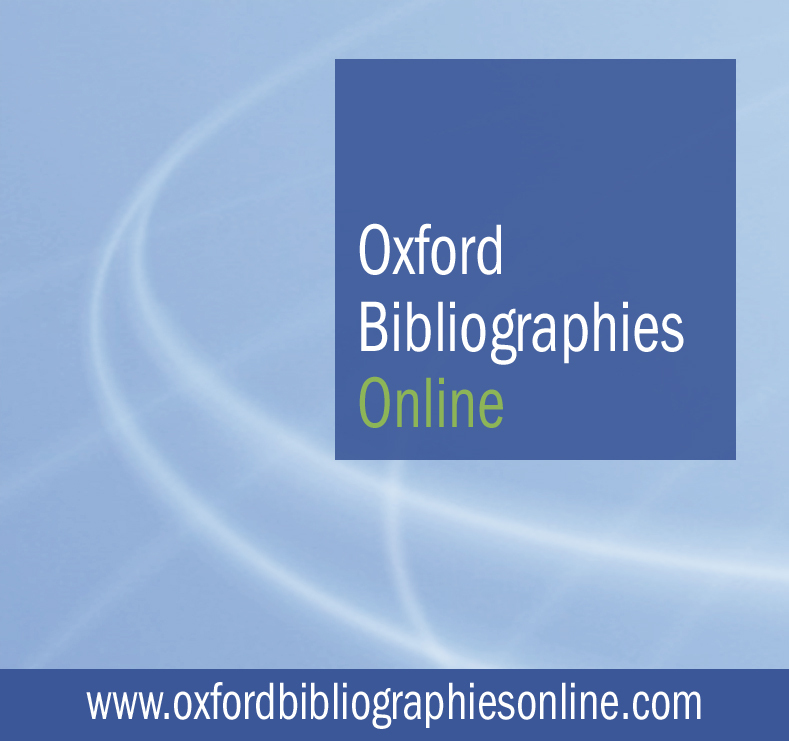 These are annotated bibliographies on a given subject intended to help give researchers a jump on their work. The list of biblical studies topics is below and includes an entry on slavery by yours truly. But I do wonder who will pay $295 a year for access to such a service. You can get a month-by-month subscription for $29.95 a month. I suppose that would work for PhD students, but I suspect this will be a resource that is somehow attached to an institution's library rather than individual scholars. Dramatized Bible Stories. Not recommended for children, but a good laugh for adults. BibleStoryZone, a website from the UK, is posting dramatized Bible stories for children. They are hilarious! They sound like a combination of Jewish midrash and a modern comedy sketch. They are hardly JUST a dramatized presentation of Bible stories. They are laden with expansions that fill gaps in the biblical text and add theological explanations. For instance, in Genesis the narrator constantly refers to the "trinity" and adds a "popping" sound every time Eve has a baby. There are also numerous references to original sin. 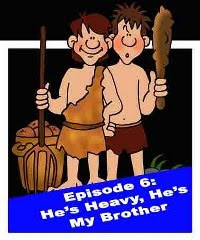 Here is the link to the Cain and Abel Story. Since I have done quite a bit of work on the interpretive history of the story I can appreciate the way they expanded it. But I am not sure that I would use it to educate children. The drink of the gods! Or at least the mug they used to hold it. 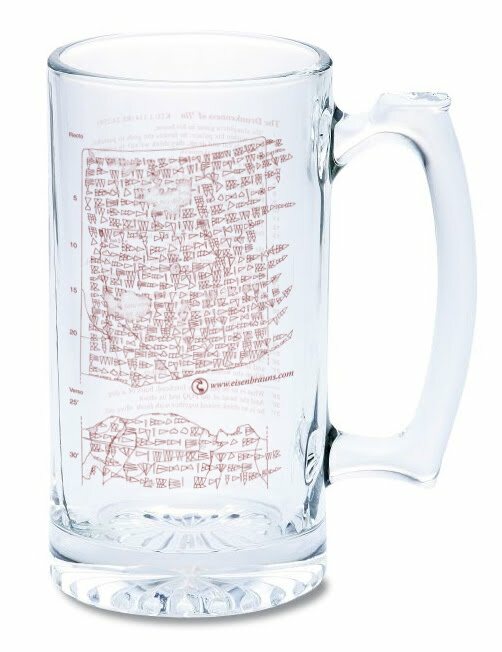 Eisenbrauns is offering a Beer (ahem) large mug shaped beverage container. It is inscribed with the "The Drinking Party of 'Ilu (KTU 1.114; RS 24.258) in both Ugaritic and English. Click here to see a picture of the original tablet along with a transliteration. Here is their description. The gods gather together to drink, Yarihu drinks himself under the table, and 'Ilu is carried home by two goddesses. 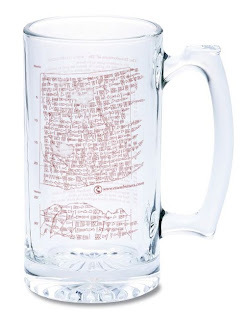 That's the story behind this mug, and the story that's printed on it, as well, with the transcription of the original Ugaritic on one side, and the translation on the other. We encourage you to imbibe reponsibly, but should you choose to drink yourself under the table like a god, consider yourself warned: the section missing from the transcription (and tablet) is the rest of the hangover remedy! I will wait to see if they are selling them at SBL in Atlanta. If not then I will need to pre-order mine. This the fourth part of my series on Terence Fretheims' book Creation Untamed. Last week we looked at suffering in the book of Job. This week we look at chapter four which is entitled "Suffering and the God of the Old Testament." The last point is the one which guides much of the chapter. Fretheim points-out that there is a strong tradition of questioning God about suffering, from the cry of the Psalmist, to Jeremiah to even Jesus on the cross (Matt 27:46). "The Bible dares to confront God with such suffering questions and invites readers in to a conversation about the nature of the connection." (103). This is a risky move for God. God may well look bad in the eyes of those who think that God should not exercise such constraint and should simply take charge or take control of such suffering moments in our lives. God's honoring of relationship opens God to the charge of neglect (105). So what then are the reasons for suffering? 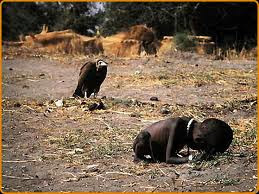 The first is that, as already mentioned, suffering is part of God's creation. 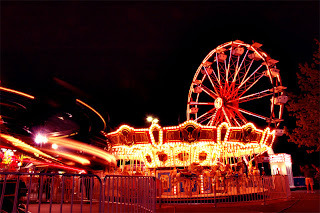 There is randomness and wildness and there are no risk-free zones. God allows the creatures to be what they were created to be, which means that bad things sometimes happen. Another major cause is sin and evil. First, our own sin which is often returned to us in the form of consequences. Second, the sin of other people that effects us even though we were not responsible for their actions. Third, the effects on the cosmic and moral order. Some of the evil that we cause has consequence not just for us, but also for other creatures and even the earth itself (112-115). Yet another reason we suffer is because we belong to communities in which the effects of sin has a long history. The result is that suffering has become woven into society's fabric and part of the system. This is sometimes manifested in things like racism, sexism and ageism. Sometimes particular individuals or even communities can embody the evil that causes this type of suffering. Other times these various forms of evil take on a life of their own and become a power unto themselves (116). Sometimes we suffer because it is part of the vocation to which God calls us. We dare not overlook the numerous instances in the Bible where we or others are called to suffer. (118). But God suffers too and it is a part of the relationship that God has chosen to enter into with creation. God "knows" the suffering of Israel (Exod 3:7) and in Jesus has entered deeply into the suffering of creation so that neither suffering nor evil has the last word. Fretheim closes the chapter with this thought. Flesh: The new NIV gets it right, mostly. The 2011 update of the New International Version is out and I have done some quick checking. You will remember my complaints about the way the CEB translates sarx as "selfish" or "self-centered". I was also less than satisfied with the NIV (and TNIV) which often would translate sarx as "sin nature" (e.g.Romans 7:5). Neither of these are helpful and I suggested that we continue to translate sarx as "flesh" in spite of the challenges that translation presents. Well, I have run a search and the 2011 NIV now translates sarx as "flesh,"at least most of the time. Romans 7:5 now reads "When we were in the realm of the flesh". The idea of the "realm of the flesh"is still more than what the Greek says ("in the flesh"), but I think it does the job. It brings the reader closer to the original while using modern language, which is the goal of the NIV. I commend the translators for undoing a translation that has stood for 32 years and has been the source of confusing theology. I agree that sarx, is still hard to define and comprehend, but I think "flesh" is a better starting point than "sin nature". But the title of this post also includes the word "mostly". I say this because in spite of translating many of the instances of sarx in Romans as "flesh", the translators have left two occurrences of "sin nature" behind. These appear in 7:18 where Paul famously tangles with the good he wants to do but does not, and in 7:25 where Paul declares that he is a slave to sin. In both of these verses it is still the "sinful nature" that causes Paul to act the way he does. And in these two cases I think the translators did not go far enough. I think they should finish the job and translate sarx as "flesh" here as well. I really not sure why they deiced this approach. This is what they have to say about sarx. Especially in Paul, sarx can mean either part or all of the human body or the human being under the power of sin. In an effort to capture this latter sense of the word, the original NIV® often rendered sarx as "sinful nature." But this expression can mislead readers into thinking the human person is made up of various compartments, one of which is sarx, whereas the biblical writers' point is that humans can choose to yield themselves to a variety of influences or powers, one of which is the sin-producing sarx. The updated NIV® uses "flesh" as the translation in many places where it is important for readers to decide for themselves from the context whether one or both of these uses of sarx is present. Again I commend them for their job. I just wish they had gone a little farther. If they want the reader to decide what the context is saying about sarx, then they should let the reader do just that. The New NIV is Available! Below is a video by Douglas Moo, the translation committee chairman. You can see it here. You can also read the translators notes. You can also search it on Bible Gateway. I will take a look at some passages in the near future and let you know what I think. Christmas was always a big deal in my home when I was growing up. All of the family from two sides would meet at our home. Every Christmas Eve one of the neighbors would dress up as Santa and visit our home just prior to us going to bed. When my mom tried to tell me there was no such thing as Santa I tried to evangelize her. I was afraid that if I had questioned some of the things or had any doubts about Christmas I might lose out. Many Christians approach Christianity and faith in the same way I did Santa Claus. They have a “Santa Claus” type faith. They have doubts about much but are afraid to express them or to explore the truth of what they believe. Somehow we have come to see doubt as a threat to faith rather than something to drive us towards faith. In Romans 4:16-25 Paul argues that it was by faith that Abraham was justified. Not by circumcision, not by obeying the law, but by simply obeying God. For some of Paul’s readers this was a paradigm shift in their understanding of how they related to God. Paul is not arguing against circumcision and obeying the law. But he is arguing against it as a way to define their relationship with God. Paul is arguing that ultimately, ones relationship with God is based on believing what God has said. 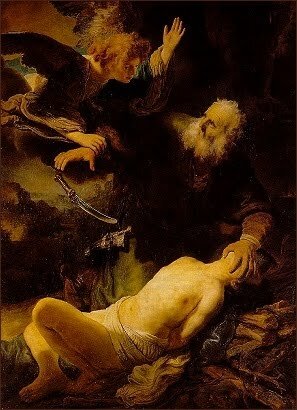 For Judaism and Paul, Abraham became a paradigm of faith. He was the ultimate example of what it meant to turn and believe in God. But holding up Abraham as a paradigm of faith is problematical even for the Apostle Paul, read Romans 4:19-21. While I agree with Paul I also have to say that this is a rather rosy view of Abraham’s life; Abraham had doubts! So did Sarah, which is why Isaac received his name and Hagar gave birth to Ishmael. The fact is Abraham and Sarah are eternal examples of people who had reservations about God’s promise, made mistakes in conjunction with that promise, and yet are held up by Judaism and Christianity as the paradigm of faith. Read through Abraham’s story in Genesis 12-24 and you will realize how much of Abraham’s life exhibits doubt and unbelief! In Genesis 17:17 Abraham laughed at God’s promise! However, Paul understood that Abraham did not have a ‘Santa Claus like faith’ but a faith that decided to trust God in spite of Abraham’s doubts and the very real obstacles to fulfilling the promise. Why did Abraham not waver in unbelief but instead grow in faith (Rom 4:20)? Because he had no choice! The more impossible the promise seemed to him the more he had to trust that God could do what he said he would do. That is faith; trusting God in spite of the impossible, the unexplainable, and even the unacceptable. It is my hope that I can, in some small way, attain to the faith of Abraham. Believing that God is able to do what He said in spite of all the obstacles to my faith in Him. I think the most dangerous thing about ‘Santa Claus faith’ is that it ultimately leads its adherents into a life in which obedience is predicated on what one can get from God. The dangerous part is that disappointment with God often occurs and leaves the individual wondering about the relationship between the unexplainable and faith. In John Irving’s book ‘A Prayer for Owen Meany’ there is a faithless congregational pastor who declares that ‘doubt is the essence of faith’. This is true because often the world we live in causes us to doubt so much, it is only at that point that authentic faith can arise. There are times when I look at the world and I have to question if there really is a god? The way things are in the world makes me wonder sometimes. But I also cannot escape the fact that creation itself shouts to me that there is a God who created all of this and somehow is holding it together. It is in those times that I need Abraham like faith. It is when I realize that there is nothing I can do. But that is where faith has to begin. Not in a way where I can see how God can do something. Only when I am at a complete loss do I really have the ability to choose faith. It is then that I have to decide whether I am going to trust God and his ability to do the things he said was going to do. That is faith; trusting God in spite of the impossible, the unexplainable, and even the unacceptable. At times I have to be like the man in Mark 9:24 who when Jesus asked “do you believe?” he replied: Lord, I believe, help me in my unbelief. This is why Abraham becomes such a great paradigm of faith for us. Not because he simply believed but because he did doubt at times but he also decided that when the situation around him looked impossible, unexplainable, even unacceptable, he decided to trust that God would be able to do the things he promised he would do. 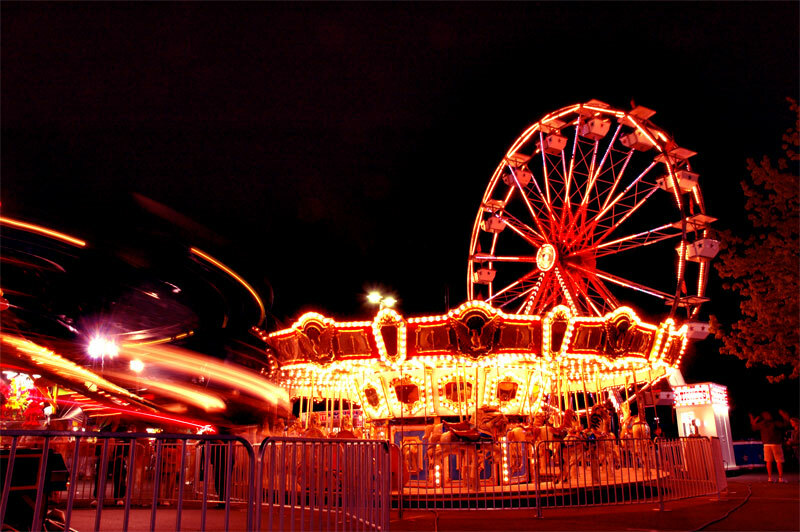 Jonathon Robinson has put together a Biblical Studies Carnival for the month of October. He calls its Oktoberfest. Stop by and see some of the more interesting posts that were done in October. Many thanks to Jonathon! 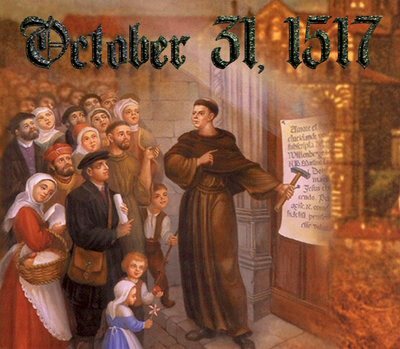 The above is a traditional portrayal of what happened on this day in 1517. Below is a more modern version. Thanks to Jim West for both of these.